It wasn’t easy maneuvering the boat up the narrow creek from the main lake. Besides the twisting channel, we had to dodge floating wood and snags that clogged the way. More than once, a submerged limb scraped the hull then popped up behind the motor. “Is this going to be worth it?” my boat mate asked. “I’m sure it will,” I replied. Despite the reassurance, I had my doubts. A fall storm had driven the water level in the creek up into the lower branches of overhanging brush. Fortunately, the rain had come and gone a few days before, so at least the water had cleared. It wasn’t until we rounded a turn and I saw a cloud of baitfish up against the bank that I became confident, and I smiled when I saw a silver flash beneath the pack of bait fish. Throughout summer, I’d been picking off crappies in the main body of Virginia’s 2,000-acre Lake Anna. The fish had come from the usual shoreline logs and brush piles, weed beds and weed edges, and also the main lake flats. Tactics used to catch the crappies had included slip-bobber jigging, trolling, casting crankbaits, and even fly-fishing small streamers. But nighttime low temperatures had dipped into the low 60s, and along with them, so had the water temperature. As they often do, the two seemed to keep pace. The fishing also had changed with the season. Though I hadn’t been on the water for two weeks, I got my first hint when I spoke with a couple of the lake’s regular bass anglers. They were catching largemouths at the creek mouths and were beginning to move into some of the larger creek arms. They told me the bait had moved into the mouths of the creeks, and some shad and minnow schools had been even farther up along the creek edges. In the fall of the year, game fish follow bait fish up the creeks, and I believe the crappies move in sooner than most. I catch good numbers of big crappies in the creeks while the bass anglers are still working out closer to the main lake. In fact, creek arms are my mainstays for fall crappies. In the summer, a few crappies may spend time in the creeks, but the real migration doesn’t begin until the water temperature falls below 70 degrees. And by the time it reaches the mid-60s, creek arms may be the best place to catch good numbers of calicoes. Where you find fallen trees and brush by the side of a steep creek bank, you likely locate a pack of crappies. Another important consideration is the size of the creek. Creek arms that are 50 to 200 feet across with a deep channel of at least 12 feet are often best. Of course, every creek is unique, and they all rise and fall with rain; so these measurements must be taken with a grain of salt. In addition, a creek that zigs and zags is usually better than a straight run. Trees that fall into straight creeks often wash out into the main lake with the first good rain, but the crooked creeks hold more of this prime crappie cover. Current is another important factor. A slow slough is not a good choice, and neither is a swift run, except if there are slower side pockets with deep enough water out of the main flow. Generally, high water does not push crappies back out into the main lake, but low water often bunches them up in a creek’s deepest pockets. Some of my favorite fall creek arms end at a dam or other obstruction. One of my favorites, on Lake Dardenelle in central Arkansas, is obstructed by a low head dam. The pool is deep and also full of woody debris. Other reasons why this spot, and others like it, are so good is higher oxygen content from the falling water and also the frothy cover of the surface foam. If a tree finds its way over the dam and settles in a deep spot where there is foam overhead, crappies find this particularly inviting. From year to year, crappies seem to favor the same creek arms. And the only sure way to locate the best spots is to fish them. Never underestimate the ability of floating debris to attract crappies. These islands of litter are not attractive, but in conjunction with the right structure, they can hold a crappie bonanza. Depending on the flow, either the inside or outside point on a shoreline curve usually produces crappies. Moderate current sweeping past an inside curve adorned with tree snags can produce the best location in the area. However, if an outside curve is deeper, or has a closer connection to deep water than does the inside line, this may be the choice spot. In order to learn which location is hot and which is not, I fish both. Then, over time, I skip the curve that has not produced in favor of the one that has. Creek channels edged by steep rock, coupled with wood hanging over from the bank, can provide outstanding fall fishing. 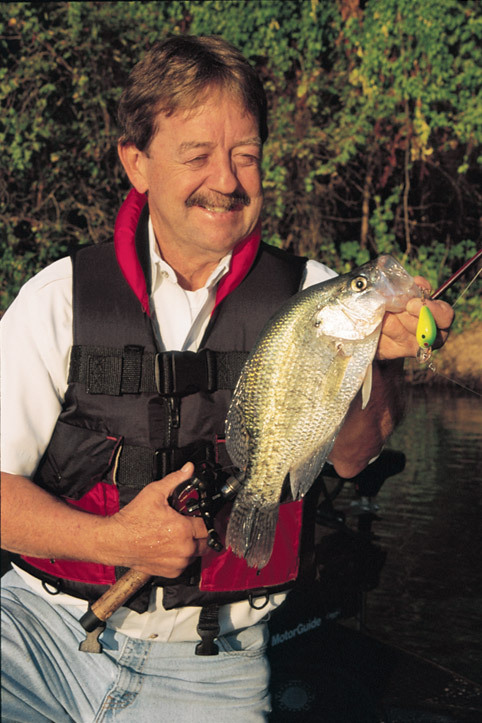 A limestone bluff creek channel in Pennsylvania’s Blue Marsh Lake often produces for me, yet I have never caught a crappie off the opposite bank, which is softer and sandier. The rocky side also happens to be at the outer, deeper curve, and fallen trees frequently hang up on the submerged ledges. Trees and brush washed up onto shallow sandy shoals rarely produce. But if you find an isolated tree or a snag stuck in the middle of a fairly deep creek channel, give it a try. However, such locations are usually good for only a couple of fish, so don’t waste time after the bite cools. Crappies around isolated mid-creek trees tend to be spooky and run for deeper water at the first disturbance. A number of times during early to mid-fall I’ve run into what I call my “green tree pattern.” That’s when the crappies favor limbs and branches that have fallen into the water still covered with broad leaves. These green trees may be against a bank or even away from it, but at certain times, the crappies obviously prefer them to the bare logs and branches. I believe it has something to do with the insects that still crawl or fly into a fallen green tree, no matter where it is. A 90-degree turn in the bank often causes dirt, gravel, and rock to build up into a marked point. These points can be either steep or shallow, long or short, and they often hold crappies. The addition of mild current is a big plus. The current flows over the point, and the crappies can wait on either the upstream or downstream side, depending on the flow. When fishing a point, I may first toss a tiny, tight-wobbling crankbait along the top and sides. This is my initial approach, to pick off the most aggressive fish. Slip bobbers with jigs, twisters or bait usually are the next offering. Where heavy wood lines a creek bank, I may fish with fixed bobbers as opposed to slip bobbers, because they make it easier to avoid the snags. Since I often share the boat with bait-angling friends, I may zip in a jig and twister before they’re baited up. I keep one rod at the ready with a yellow-and-red jig with a motor oil tail, suspended below a spring bobber. It’s amazing how often I pick off a couple of quick fish with this offering. When the crappies get tired of this, I may switch to another color, but I more often follow up with a live minnow on the back of the jig. Where the water is clear, fly-casting a small streamer can become exciting sight fishing. Watch the lightly weighted fly slowly settle, giving it the shortest of strips. When the fly suddenly disappears, raise the rod and set the hook. Yet the real trick to the fall crappie game is not the how but the where. Concentrate on the creek arms and the fishy spots within those creek arms. If you want to catch big crappies in the fall, sometimes you have to go up a creek after them.